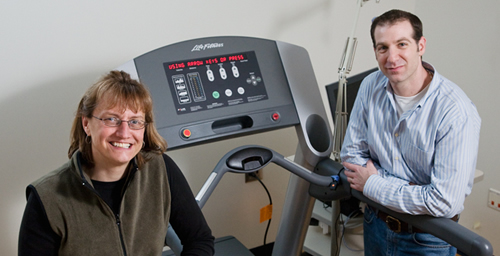 Charles Hillman and Darla Castelli, professors of kinesiology and community health, have found that physical activity may increase students' cognitive control - or ability to pay attention - and also result in better performance on academic achievement tests. CHAMPAIGN, Ill. - As school districts across the nation revamped curricula to meet requirements of the federal "No Child Left Behind" Act, opportunities for children to be physically active during the school day diminished significantly. Future mandates, however, might be better served by taking into account findings from a University of Illinois study suggesting the academic benefits of physical education classes, recess periods and after-school exercise programs. The research, led by Charles Hillman, a professor of kinesiology and community health and the director of the Neurocognitive Kinesiology Laboratory at Illinois, suggests that physical activity may increase students' cognitive control - or ability to pay attention - and also result in better performance on academic achievement tests. "The goal of the study was to see if a single acute bout of moderate exercise - walking - was beneficial for cognitive function in a period of time afterward," Hillman said. "This question has been asked before by our lab and others, in young adults and older adults, but it's never been asked in children. That's why it's an important question." For each of three testing criteria, researchers noted a positive outcome linking physical activity, attention and academic achievement. Study participants were 9-year-olds (eight girls, 12 boys) who performed a series of stimulus-discrimination tests known as flanker tasks, to assess their inhibitory control. On one day, students were tested following a 20-minute resting period; on another day, after a 20-minute session walking on a treadmill. Students were shown congruent and incongruent stimuli on a screen and asked to push a button to respond to incongruencies. During the testing, students were outfitted with an electrode cap to measure electroencephalographic (EEG) activity. "What we found is that following the acute bout of walking, children performed better on the flanker task," Hillman said. "They had a higher rate of accuracy, especially when the task was more difficult. Along with that behavioral effect, we also found that there were changes in their event-related brain potentials (ERPs) - in these neuroelectric signals that are a covert measure of attentional resource allocation." One aspect of the neuroelectric activity of particular interest to researchers is a measure referred to as the P3 potential. Hillman said the amplitude of the potential relates to the allocation of attentional resources. "What we found in this particular study is, following acute bouts of walking, children had a larger P3 amplitude, suggesting that they are better able to allocate attentional resources, and this effect is greater in the more difficult conditions of the flanker test, suggesting that when the environment is more noisy - visual noise in this case - kids are better able to gate out that noise and selectively attend to the correct stimulus and act upon it." In an effort to see how performance on such tests relates to actual classroom learning, researchers next administered an academic achievement test. The test measured performance in three areas: reading, spelling and math. Again, the researchers noted better test results following exercise. "And when we assessed it, the effect was largest in reading comprehension," Hillman said. In fact, he said, "If you go by the guidelines set forth by the Wide Range Achievement Test, the increase in reading comprehension following exercise equated to approximately a full grade level. "Thus, the exercise effect on achievement is not statistically significant, but a meaningful difference." Hillman said he's not sure why the students' performance on the spelling and math portions of the test didn't show as much of an improvement as did reading comprehension, but suspects it may be related to design of the experiment. Students were tested on reading comprehension first, leading him to speculate that too much time may have elapsed between the physical activity and the testing period for those subjects. "Future attempts will definitely look at the timing," he said. Subsequent testing also will introduce other forms of physical-activity testing. "Treadmills are great," Hillman said. "But kids don't walk on treadmills, so it's not an externally valid form of exercise for most children. We currently have an ongoing project that is looking at treadmill walking at the same intensity relative to a Wii Fit game - which is a way in which kids really do exercise." Still, given the preliminary study's positive outcomes on the flanker task, ERP data and academic testing, study co-author Darla Castelli believes these early findings could be used to inform useful curricular changes. "Modifications are very easy to integrate," Castelli said. For example, she recommends that schools make outside playground facilities accessible before and after school. "If this is not feasible because of safety issues, then a school-wide assembly containing a brief bout of physical activity is a possible way to begin each day," she said. "Some schools are using the Intranet or internal TV channels to broadcast physical activity sessions that can be completed in each classroom." • encouraging classroom teachers to integrate physical activity into learning. An example of how physical movement could be introduced into an actual lesson would be "when reading poetry (about nature or the change of seasons), students could act like falling leaves," she said. The U. of I. study appears in the current issue of the journal Neuroscience. Along with Castelli and Hillman, co-authors are U. of I. psychology professor Art Kramer and kinesiology and community health graduate student Mathew Pontifex and undergraduate Lauren Raine. Editor's note: To contact Charles Hillman, call 217-244-2663; e-mail: chhillma@illinois.edu or Darla Castelli, call 217-333-9650; e-mail dcastell@illinois.edu.